Material: Frame in extruded aluminium. End caps in cast aluminium. 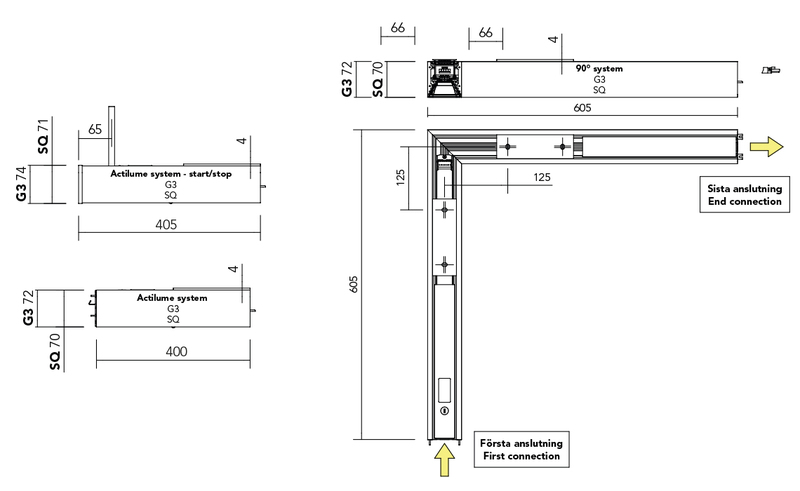 Installation: Frame snaps against the enclosed ceiling profile. System: First luminaire is supplied with end caps. Eccentric lock connects luminaires mechanically. 3G0.75 mm², or 5G0.75 mm² (dimmer). System start is supplied with halogen-free cable 3G1.5 mm², or 5G1.5 mm² (dimmer). Cable length 1, 2, 3, 4 m and optional quick connector is selected in configurator. System is supplied excluding cable. Quick connector for electrical connection with system luminaire or system start luminaire. Optical diffuser in MIRO material in combination with optical film from BrightView. The luminaire is also offered with microprism excluding optical film. Light source: Includes Philips Fortimo LED light source, colour temperature 3000K or 4000K. Colour rendering CRI min. 80 or CRI 90. Chromaticity tolerance max 3 SDCM. Rated lifetime: L100B10, 50 000h. Driver: Equipped with LED driver Touch and DALI from Philips to regulate the light with amplitude modulation creating a flicker-free light. Light regulation 1-100%. Luminaire is equipped with 2 ballasts/2 DALI addresses. 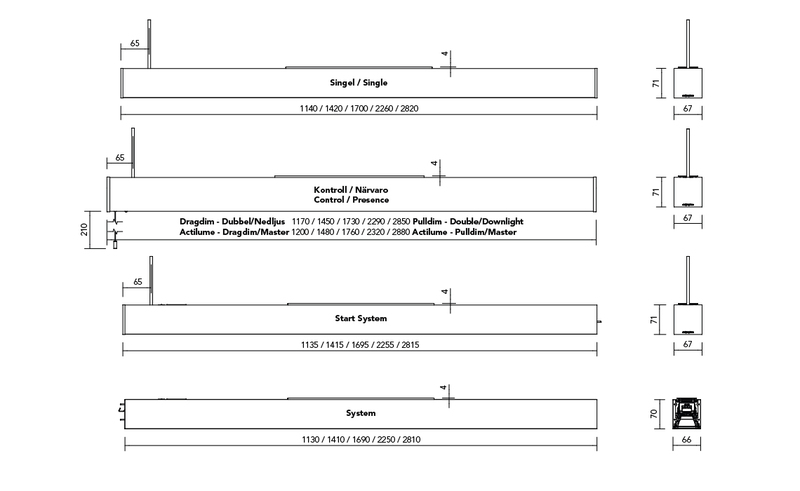 lifespan of the luminaire, in comparison with a L80 luminaire. Other: Luminaire with microprism comes as standard with two different luminous luminaire flux, HE (High Efficiency and HO (High Output). Tunable White is available on request. Note the direction of the 90° luminaire. See drawings under Technical information. Standard finish: White textured RAL9010 or Grey textured RAL9006. Standard connectors can be found in the file Standard Connectors. Other types can be delivered on request. "Touch&DALI - Driver with DALI-based control system. Possibility to occupancy control to save energy, so called ""Corridor Mode""
Actilume/Dragdim - DALI-based control system. Sensor integrated in luminaire. Occupancy control, daylight control and IR receiver for remote control. Automatic on/off (delay 15 min). Daylight sensor automatically set at 600 lux. Manual adjustment of settings. Manual control via pull cord. 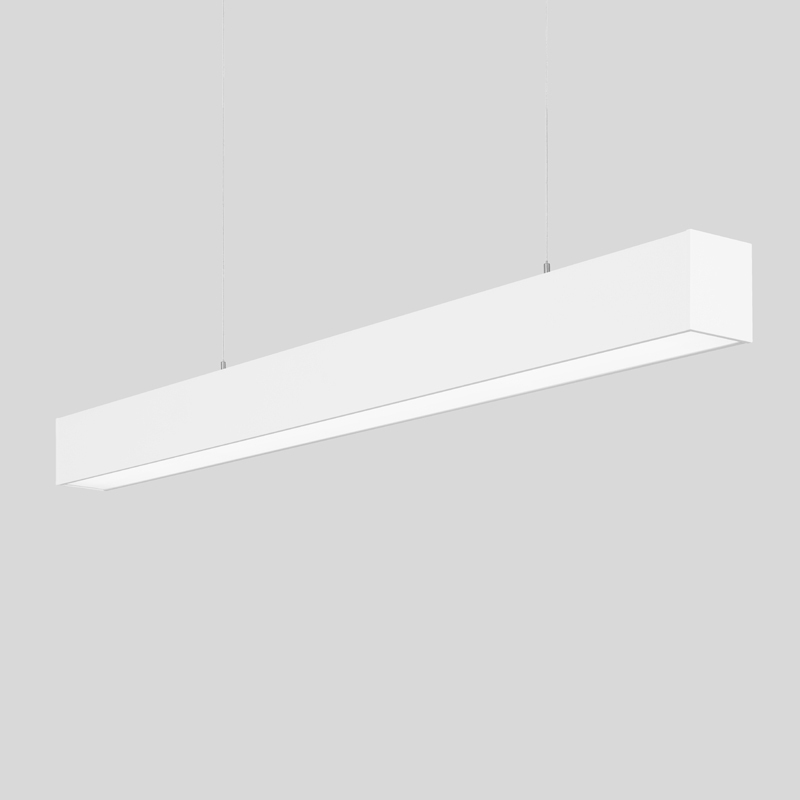 Adds 60mm to luminaire length. Pull switch - On/off and dimming on down light by pull cord. Up light is constant. Set value is retained after power failure. Adds 30mm to luminaire length. Master Actilume - Master luminaire Philips Actilume sensor and DALI ballast. Adds 60mm to luminaire length. Double Pull Switch - Fitted with double pull switches for separate control of up- and down light. Adds 60mm to luminaire length"